Iron-ically, thanks to canny marketing and shifting attitudes, ironing is now something blokes are more than happy to boast about doing. And if you're doing the ironing, you want the BEST iron, damn it. Today’s modern gent wants to look sharp, and his trusty iron is on hand to help. The modern iron is sleek, powerful, and either adorned with lots of inexplicable buttons and knobs, or totally lacking in them, because the iron does all the thinking for you. Homewares are a popular product category so you're likely to save a bit of cash on your crease destroyer of choice. And there are already plenty of discounts to be had – you'll find the best of them further down the page as we check prices at thousands of retailers every day to ensure you get the flattest prices and don't end up steaming over a bad purchase. Our iron of choice is the Philips Azur Elite (scroll down for full review). This steamy operator takes most of the hassle out of pressing clothes as it has just one temperature setting and cannot burn fabric – you can leave it, plate-down on clothes and they won't get singed. This feature is by no means unique to Philips but it serves it up in the most straightforward, satisfying, idiot-proof way. Not that I'm calling you an idiot. If you’re on a budget or just have a less frequent need to iron, the Breville PressXpress iron is much cheaper but still effective. If cordless irons are your kind of thing, perhaps give the slightly flawed Russell Hobbs Freedom a whirl. If you're really serious about ironing, we recommend a different Philips model: the PerfectCare Elite Steam Generator (scroll down for full review). This very nearly achieves the unlikely feat of making ironing almost fun – again, there's no temperature gauge, no possibility of burning clothes, and thanks to the large water reservoir and powerful pump, enough steam to get rid of even the most testing creases. If you iron a lot of clothes, paying more for a really good steam iron is money well spent, in my opinion. Look for one with the largest possible water reservoir and, if you live in a hard water area, either use filtered or distilled water, or look for an iron with an effective de-calc function. Modern irons with auto-sensing tech are also a fantastic choice. It means you don't have to worry about setting the correct temperature for different fabrics. If you are really serious about crease removal, but don't want to devote many tiring hours to it, a steam generator could be for you. They are more expensive, bulky and can take longer to warm up, but because most of the work is performed by the steam and not your arm, they are near effortless to use – ideal for daunting laundry piles. You won’t find any temperature setting dials on this amply powerful iron because it doesn’t need any. Instead it cleverly optimises the temperature no matter what you’re ironing, whether it’s heavy denim or fine silk. Indeed, this tech is so bewilderingly brilliant you can even leave the iron facedown on delicate fabrics and it won’t burn or leave any marks. Yes, fellas: no more scorched chiffon disasters. Phew. The Azure Elite also comes with three steam modes: DynamiQ, Max and Ionic. 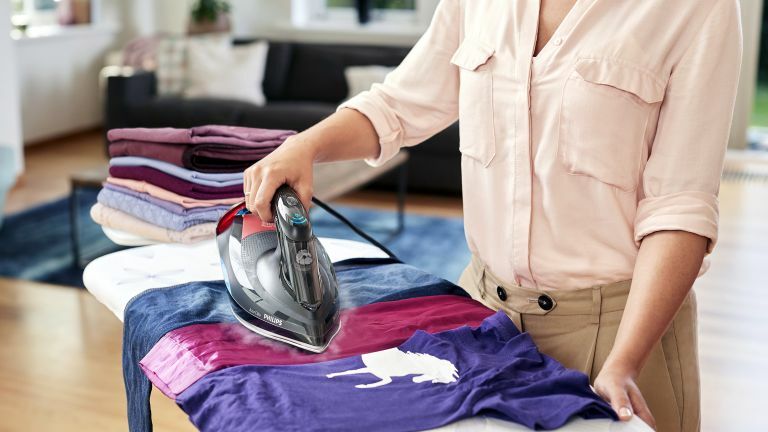 DynamiQ uses a motion sensor to detect the iron’s movement and switches the steam off as soon as it comes to a stop, resuming once the iron is moving again. This saves water in the 350ml tank and reduces the number of trips to the tap. The Max setting is as it suggests – a full constant blast for flattening heavy creases. Ionic provides intermittent bursts ‘rich with silver ions for more hygienic ironing’, whatever that means. I haven't used that mode much. Spec-wise, this iron delivers an industry-leading 75g per minute of constant steam and an impressive 260g steam boost when sh*t gets real. The SteamGlide soleplate does indeed steamily glide over fabrics with consummate ease. Add a doddlesome anti-calc system, a comfy handle and a three-metre cable and you have the most streamlined and practical iron on the market. At the risk of seeming like T3 is on Philips' payroll, I also think the best steam generators come from its factories. Steam generators have long been the best option if you are regularly faced with mountainous piles of laundry, although the most cutting edge steam irons are now catching up. This elegant, Which?-awarded steam generator was the most expensive model in the Philips range but now seems positively affordable compared to the likes of the PerfectCare Elite Plus and Elite Silence. As with all such appliances, it comprises a large, detachable 1.8-litre water reservoir that continually pumps high-pressure steam (120 g/min) to a comfortable and unbelievably lightweight iron unit. This glides over tricky cotton-rich fabrics like an air hockey puck. If you hit a troublesome patch, double tap the button for a whopping 470g steam boost. Making things even simpler, the Philips PerfectCare has no temperature controls at all. Instead, the ingenious OptimalTEMP technology controls the heat of the soleplate so you can swap from silk to denim without having to fiddle with different temperature settings. A remarkable side effect of this system is that you can leave the iron face down on fabric – even silk – without burning it. Add Philips' effective Easy De-Calc Plus lime descaler function and you can be sure this smooth operator will remain gunk-free for years to come. Yes, you will do to wait a little longer for it to reach operating temperature, and pay more for the privilege, but seriously, if God wanted to flatten the Himalayas, this is what he’d use. Lower down the price scale to the Philips machines is the quite horrifically spelled Sensixx’x. It is a decent bargain and ideal for those who iron a bit less frequently, or simply have less money to burn. The Sensixx’x heats up pretty pronto and features an easy-glide CeraniumGlissée soleplate with precision tip and a 40 g/min continuous steam output that makes light work of even the most rebellious fabrics. And should you reach a crease too far, simply hold in the 180g boost button and it’ll flatten it in a thrice. It also comes with an easy-to-fill 320ml water reservoir and an excellent three-stage anti calc system to keep scaly spurts at bay. This 2,800 watt model doesn’t feel too heavy in the hand and is generally easy to use though the handle is quite small which means the three-metre power cord rubs against the hand which is a bit irritating; perhaps consider a different model if you have big hands, dude. Like the number one Philips, the Tefal UltraGliss has just one fixed, no-burn heat setting for all fabrics, so switching between silks and Denims is a breeze. The Tefal makes the most of its 40 g/min steam output by way of a smooth-running Durilium Technology soleplate fitted with extra steam holes at the tip and on the edges. A 150g/min blast is good for stubborn creases and an Eco mode reduces energy consumption by 20%. If you're on an even tighter budget, this slightly older Tefal won't let you down. Braun's Carestyle 3 is pretty keenly priced for a steam generator, and comes in three variants, each with a slightly different steam output. This particular 3041 model produces a continuous output of 120g/min and a perfectly adequate steam boost of 310g/min. It’s an ideal model for medium-sized piles of laundry though its ironing unit is pretty chunky – nothing like as sleek as the more expensive Philips PerfectCare models. Its iCareTec system, rather like said Philips model, utilises a smart textile protection system to set the correct temperature for every fabric. And that, in theory, means no more scorched delicates. Possibly the most useful innovation here is the slippery, Eloxal-coated 3D BackGlide soleplate, which consists of a smooth, rounded rear section that allows the iron to hover over fabrics whether its moving forwards or backwards. That means no more reverse snagging and bunching, especially when ironing lighter fabrics. It’s also durable, so you can iron over zips and buttons without needing to worry about scratches. The generator heats up in a respectable two minutes and comes with a two-litre reservoir – one of the largest on the market – and a great cord storage facility. Arguably, the very best thing about this steam iron is that it has a click-in lock mechanism that’s faintly reminiscent of loading a magazine into a gun. Clack clack! Yes, sorry, that is very childish. Yes, it’s another Philips, but that’s because Philips makes very good irons: they’ve dominated the likes of the Good Housekeeping Institute’s best buys for years and garner consistently excellent reviews from customers. And us. The Azur Performer shares the faintly videogame-y design of our current favourite, the Azur Elite, but dials down the power a wee bit and costs a little less as a result. It’s not as mad as the Elite but it’s still pretty powerful, with a 210g steam boost, 50g/min steaming for crease removal and a 2,600w heating element. However, it’s considerably lighter: 1.5Kg compared to the Elite’s two-plus kilos. If you’re slender of frame or don't have great grip, that weight difference means a lot when it comes to comfort during longer ironing sessions. The lesser weight does make it a little less effective on really creased garments, but we think it’s a worthwhile trade-off. Funky by name, more like a Teddy Boy by nature, this home-grown retro cloth presser is arguably one of the most striking irons on the board and is a choice par excellence for Smeg and Dualit fans, or indeed anyone into the whole ’50s retro thing. However, it’s not all style over substance since it comes with pretty much everything you’d expect of a decent quality iron, a steam shot function notwithstanding. Mind, it doesn’t really need one because its 50g/min continuous steam output is marginally more than the average. Rather handily, it also features three steam output settings from gentle to geyser, though the three-position switch does feel flimsy. At 1.3kgs, the Funky is weighty in the hand but thankfully its ceramic soleplate coasts across fabric like skates on ice, so it’s easy enough to push about. It also has a large 450ml water tank, a decently long three-metre power cable and a basic self-clean feature. The Funky Iron is available in three shiny perspex-like finishes – deep red, black and teal turquoise – and performs ironing duties without fuss, though its bulbous shape does make it impossible to wrap the cord around for storage. But, hey, that’s never stopped anyone from buying an iron. This portable hand steamer is perfect for the travelling business bod, or indeed anyone who has ever tried to borrow an iron at a hotel. You know the scenario. Either another guest has already nabbed the only iron in existence or the iron they’re able to loan you resembles something your great grandma might have used. And then there’s the hassle of trying to fit the ironing board in the tiny space between the end of the bed and the obligatory writing desk that no one ever uses. Frankly, I never expected this product to make much impression on my heavily creased, hand-held T-shirt but blow me down with a feather if it didn’t remove all the creases without the hot metal plate even touching the fabric. It did so very quickly, too, and without producing any significant amounts of steam; certainly nothing like the geyser-like blast of your average bogstandard iron. Despite how well this works, the £100 asking price does seem a bit steep given all the plastic involved; the AC cable could do with being a bit longer, too. That being said, if you do a lot of business-based travel with suits, shirts, skirts and blouses then this small, eminently packable package will get you out of a tight fix. After all, who wants to turn up at the investor’s meeting looking like a corrugated scarecrow? The keenly priced 2800-watt PressXpress uses a wide ceramic soleplate which is more slippery than plain steel while distributing the same level of heat. It also has a precision tip which is good for navigating around the shoulder blades of shirts and between pleats on blouses, etc. It provides a constant steam rating of 40g/min and a not-too-shabby 180g steam shot for unruly creases, and it can also be used vertically for flattening suits, dresses and curtains. Unlike on more costly models there is an olde worlde temperature dial, with all the usual suspects – linen, cotton, wool, synthetics, silk. There’s a not-especially-tactile, sliding steam-strength switch on top, along with buttons for steam boost and fine spray. Like most modern irons, it does have a self-cleaning function. Finally, those who have trouble filling their iron without splashing water all over the place will greatly appreciate this model’s extra wide opening which allows you to fill the huge, industry-leading, 400ml reservoir from a running tap or wide-rimmed glass. Nice touch. Copper is an excellent heat conductor; in fact it’s second only to pure silver. Of course, a solid silver iron would not only be impractical (it’s too soft a metal) but also extortionately expensive. So the bods at JML have gone for the next best option and created a soleplate that encompasses both copper and ceramic. According to the blurb, the ceramic part of it heats up quickly while the copper retains heat for longer. All we know is that this thing gets damn hot – and seems to stay hotter for longer than your average iron. Why that should be a benefit is a moot point. When it comes to actual ironing, this model does the job very well – the soleplate glides smoothly and there’s plenty of steam on tap – but isn’t a whole lot better than most of the other models here. Also, the steam is only available at higher temperatures and that could be an issue if ironing delicates like silk. Despite its macho copper looks, the Phoenix is a bit of a clunky, angular beast that’s nowhere near as light, practical or pretty as the winning Philips Azure Elite. But then the Philips is at least three times the price. You decide.